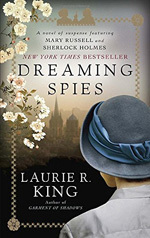 This Mary Russell and Sherlock Holmes novel is placed in our Asia category because of its vivid sense of things Japanese in the 1920s. Mary and husband Sherlock elect to return home after a long stay in India via the steamship Thomas Carlyle. Their hopes for a vacation voyage become complicated when, on board, they are drawn into plans to uncover the blackmailing schemes of one of the passengers, Lord Darley. Mary also meets and befriends Haruki Sato, a petite mysterious woman who claims inheritance and training from a long line of ninjas. To pass the time, Haruki teaches Mary about Japanese customs and language, and then reveals her real task, to recover a book written by the famous seventeenth-century itinerant poet and master of the haiku form, Matsuo Basho. When the ship reaches Japan, the couple is encouraged by Haruki to follow some of the travels of Basho. Their fascination and appreciation of Japan is increased even when Haruki draws them into her plans to prevent threats to the Prince Regent, Hirohito. In the process, Mary, with guidance from Sato, turns her talents to try and recover the stolen Basho book and, as it turns out, a precious document hidden within it. Each chapter is headed with lovely Basho inspired haiku poems, including some which are used in the the text.